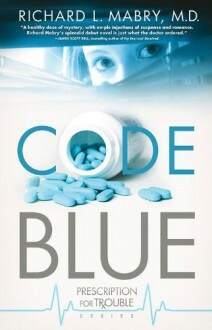 In the first book of the Prescription for Trouble series, Code Blue means more to Dr. Cathy Sewell than the cardiac emergency she has to face. It describes her mental state as she finds that coming back to her hometown hasn t brought her the peace she so desperately needs. Instead, it s clear that someone there wants her gone...or dead. Cathy returns to her hometown seeking healing after a broken relationship, but discovers that among her friends and acquaintances is someone who wants her out of town...or dead. Lawyer Will Kennedy, her high school sweetheart, offers help, but does it carry a price tag? Is hospital chief of staff Dr. Marcus Bell really on her side in her fight to get hospital privileges? Is Will s father, Pastor Matthew Kennedy, interested in advising her or just trying to get her back to the church she left years ago? When one of Cathy s prescriptions almost kills the town banker, it sets the stage for a malpractice suit that could end her time in town, if not her career. It s soon clear that this return home was a prescription for trouble. Hated the church stuff, medical stuff okay.But it was FREE!